The Wacky Packages Web Page!! Take a tour of some of the all-time favorite Wackys! or call the Wacky Pack Hotline: 267-243-6111, ask for Greg. 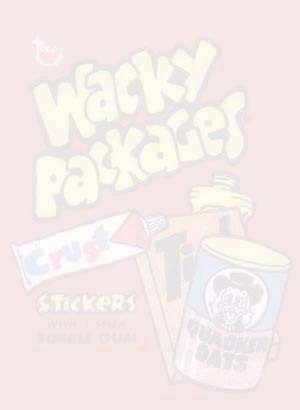 Wacky Packages are stickers (peel and punch-out) that were released by the Topps Chewing Gum company (and their Canadian partner OPC) from 1967 to the most recent series in 2008. They parodied common household products and were extremely popular among children in the 1970's. Read what some of the newspapers had to say at the time. Between 1997 and 2008, with the help of the internet, Wackys experienced a great resurgence of popularity as more and more people in their 30's and 40's, recall this childhood craze and desire to re-collect them. Here are the top ten reasons why people love Wackys. To all of our amazement, in 2004 Topps brought wackys back, and they did so with considerable success. This has blasted the hobby to a whole new level. What the future holds, nobody knows. If you just need some honest advice about wackys, you should feel free to email me, greg@wackypacks.com. All questions will be answered, from the basic to the complex, so don't be shy. We're adding pages regularly, eventually there will be complete scans and in-depth information for every series. March 24th, 2004. This web site www.wackypacks.com was featured on show "Entertainment Weekly - Digital Review" on cable news channel NY1. Click here for the story on their website. And click here for the video in mpeg format (approx 3 minutes and approx 28 megabytes - for best results right click to save to your disk and play after completely downloaded).